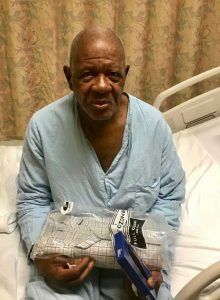 It’s been months since an elderly Guyanese man has been a patient of the Bellvue hospital in Manhattan, New York after losing his memory. The man gave his name as Ulric McDonald, and Ulric Bobb called “Piah”, 75, of Belladrum Village, West Coast Berbice. He is pleading for help to be reunited with relatives so that he can return to Guyana since he cannot remember where he lived in the United States. Guyanese activists from non-profit organizations United Bridge Builders Mission (UBBM) and Guyana Action Committee (GAC) are on the case and working to reunite the man with his family and help him to safely return home. Operations Director of GAC, Bonita Montaque, assured that once his identity is verified and relatives located, the organization will pay the expenses associated with him returning to Guyana. Anyone with information is asked to contact 718-879-2662, 718-926-9445/914-439-4960.